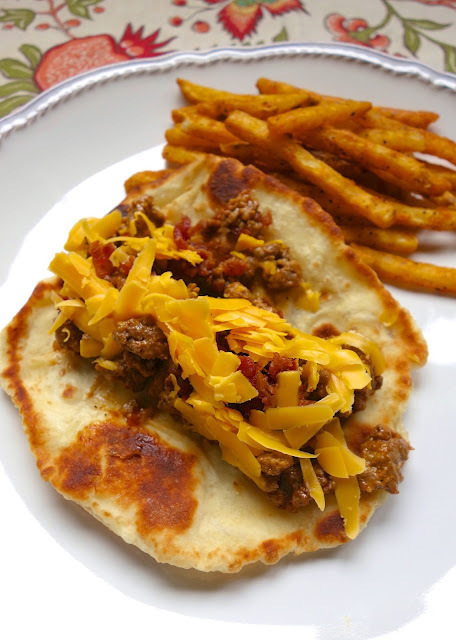 These Bacon Cheeseburger Flatbreads are to-die-for! They are super easy to make and pack a ton of flavor! I could eat these every day! These flatbreads are great for lunch or a quick dinner. 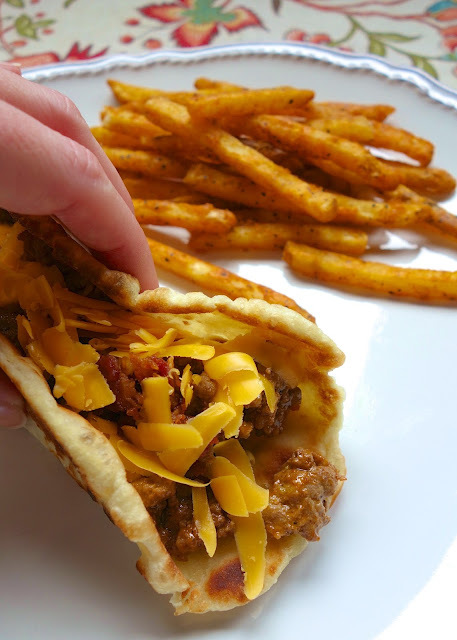 The flatbread is great on its own, but it is really over the top with the warm hamburger, bacon and cheddar. I mean, how could you go wrong with bread, meat, bacon and cheese? The flatbread is made with frozen bread dough. It will take about 25 minutes for the dough to thaw. If you are in a hurry, pop the dough in the microwave for 45 seconds. I used the microwave method, and it worked great! Just roll dough out as thin as possible. Don't worry if they are funky shapes. It will still taste great! Serve with some french fries or chips! Enjoy! Allow dinner rolls to thaw, 25-30 minutes. You can also microwave the rolls for 40-45 seconds. While the rolls are thawing, brown hamburger meat. Drain fat. Stir in onion flakes, garlic powder, pepper, ketchup, mustard and Worcestershire sauce. Simmer 5-10 minutes over low heat. Once rolls are thawed, roll out at thin as possible. Heat 1-2 tablespoons of canola oil in skillet over low heat. Cook bread about 1 minute on each side. Drain on paper towels. Top fried bread with warm meat mixture. Top meat with some bacon pieces and cheddar cheese. YUM!!! You always share the best recipes and it seems like you know how I need quick, but good meals using only a few ingredients that I always have on hand. Oh, and.....WAR EAGLE from Auburn!!! The fries are Checkers/Rally's from the freezer section. They are YUM! I did shred the cheese myself - SO much better! Made these last night for my very picky family of mostly boys...they all liked them! Thanks for a new recipe. YAY! So glad it pleased the picky eaters! My family loved this....Thanks for a great recipe! Thanks for the great and easy recipe! Definitiely a hit in my house, even with my picky eater! YAY! so glad to hear it was a success! the boyfriend made these last night while I was at the gym and they were wonderful. we will have them again & again. thanks for the recipe! Just made these tonight and lemme say THEY ARE AWESOME!!!! I don't think they have Rhodes around here (So Cal) but I will look for something else because these sound delicious! If you can't find frozen rolls you can use a tube of refrigerated pizza crust dough. Just roll thin, cut & fry. I like it better than rolls cuz you don't have to wait for it to thaw. We love these at our house!